Kate wanted to go up to the North Shore, and so I took the day off to go with her. We had a great hike out at one of the state parks where we saw monk seals and nesting/flying albatrosses. As it turned out, while we were up there, the big waves rolled in and they held a not-so-annual big wave surfing competition. In fact, it had not been held for a half dozen years because the waves have to be at least 30 feet for a sustained period. Earlier this year it was scheduled, but then called off. Because we were just 4 miles down the road, we got to see this event, and that’s exactly what it was. The crowds were everywhere. I think I heard that something like 25,000 people descended onto this beach. Some people had gotten their spots the evening before, while others came at 6am for the competition that started at 8am. The crowds were remarkably well behaved, and they cheered when surfer’s went for a wave and when they came in. A very supportive crowd. The event was broadcast on CBS, and there were quite a few sports photographers there. We ended up adjacent to the launch spot – fantastic seating to see the surfers come in and out. 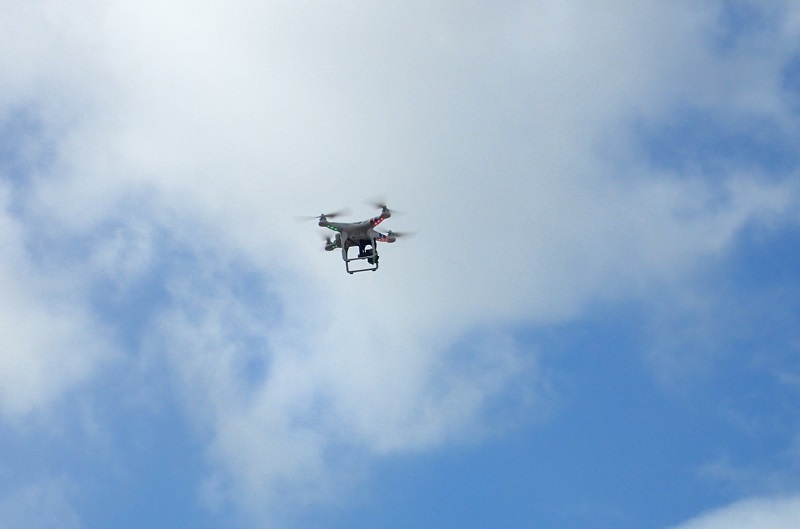 The event also used drones that flew up and down the beach and all the way out to where the surfers were riding waves. 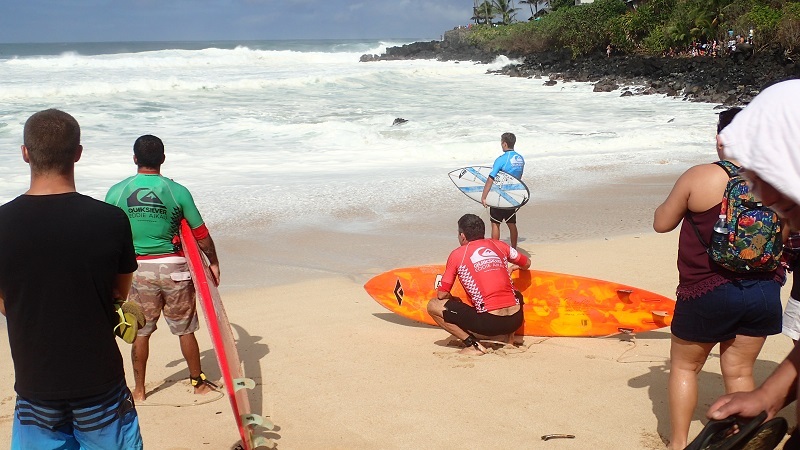 The surfers all seemed very collegial with each other and most appeared to know each other. 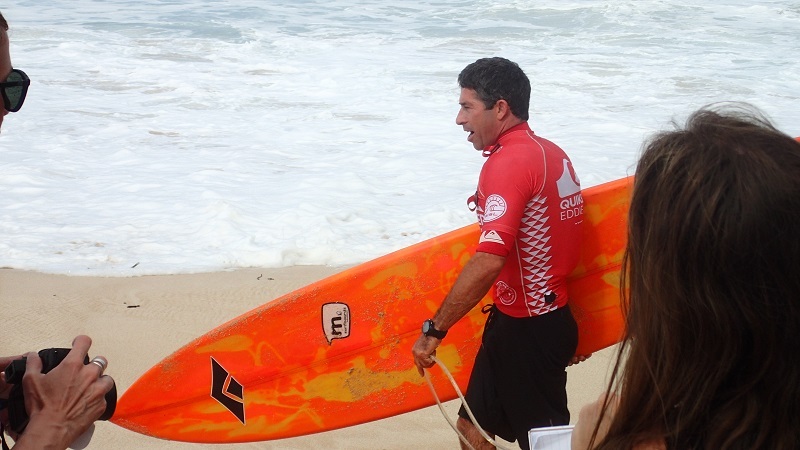 Since I am not into surfing, I had no idea who these celebrities were. Here are some photos in the event that you know. There was one fellow whose name was given to us by the person next to us. 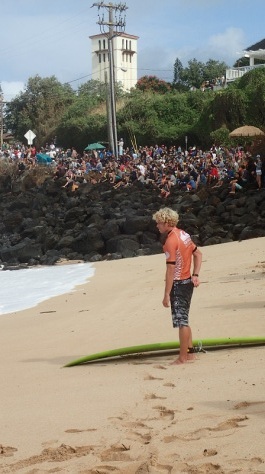 That was John John Florence, and he was a local who apparently was a favorite in the competition and did in fact win. Here’s a picture of him studying the water while the crowd looks on. 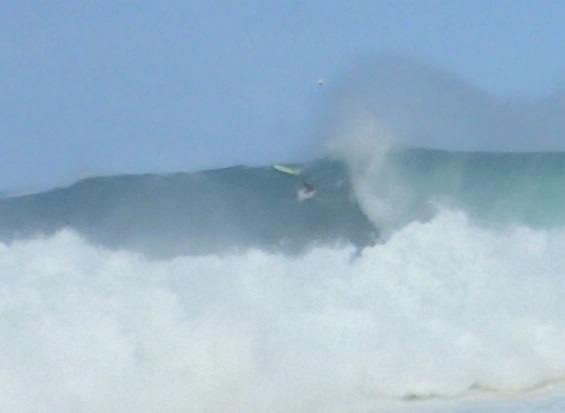 Just so you realize how dangerous this appeared to be, here’s a photo of a surfer making an entry onto the wave. The boards that they are carrying are 10-12 feet long. Apparently the height of the waves was around 40 feet. Some of these entries appeared to be near-vertical descents. All in all, it was good fun. 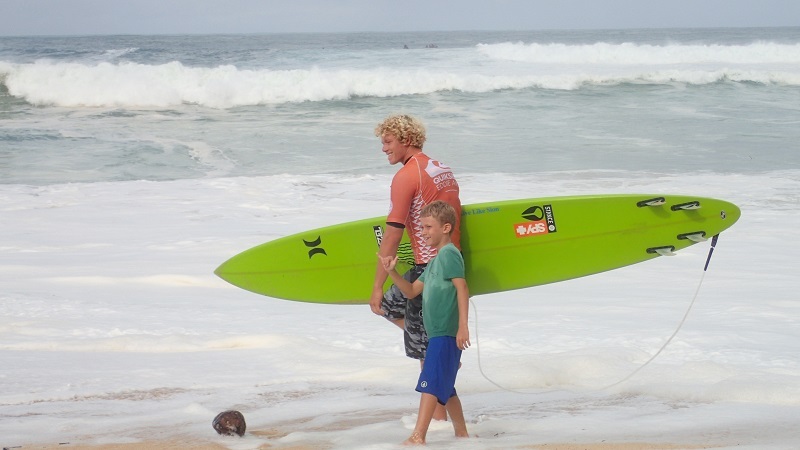 And if you’re going to go to a surf competition, I guess this one was a good as it gets from what I gathered. We have moved to Oahu, and are now living near Diamond Head in Honolulu. It’s a quiet community between Kaimuki and Kahala, and we have a three bedroom home with one room as a guest room! Let us know if you want to come visit! Here’s a photo of the closest beach to us, about a 1 minute drive. 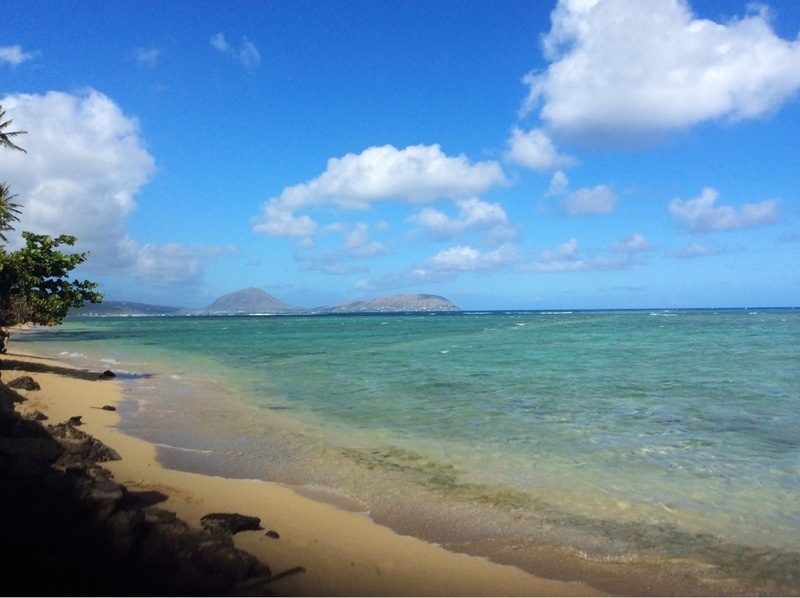 This Kahala beach is quiet with few tourists visiting it. We have not yet snorkeling around in the water, but we have gone swimming as the waves break about 400 yards off shore. I drive home for dinner after a visiting a resident at home. It is quiet here. It is always quiet here. No blaring music, honking cares, sirens, loud voices, or traffic jams. I know each person I pass on the road and we wave to one another. As I turn down my street, looking left, a wide-arced rainbow graces the sky next to the pali (cliff). How can one NOT stop and ooh and aah? In fact, I see others in the settlement doing the same; walking onto the street, looking in the same direction. Rainbows have a way of bringing us outside in unison; pointing our cameras all in the same direction, hoping to capture for eternity a moments dazzling light show. Rainbows are everywhere here. I have never seen so many…ever. Appearing suddenly, I struggle to take the perfect picture, sometimes missing the brilliant hues for want of the BEST rainbow picture ever. There’s something hopeful, fresh, and dynamic about the phenomenon of light reflecting and refracting through water droplets in the atmosphere; a simple, spontaneous gift of the moment, in a very beautiful place. I took some time to go down to the wharf today at noon and past the airport today. The waves were supposed to be gigantic (60 feet) in some places, but they were probably only about 15-20 feet in Kalaupapa. For anyone who did not get a copy of this years end-of-year newsletter, click here to download it. Over the years, I have found many holiday letters force the reader to read everything and then they can decide afterwards what parts they did and did not have an interest in reading. We decided to let the reader pick and choose up front and to put in a variety of content themes. We hope you like it. Technical note: For those of you who are techies, I hand-edited all of the photos in Photoshop and created each of the five pages in Photoshop. The pages were printed to PDF using the Adobe printer driver as it makes for smaller pages than the “Save As” feature in Photoshop. Today my girlfriend and I were to take off in a plane from topside Molokai to Honolulu for a few days away from the settlement. The plane was a single engine Cessna, and one of the very few to be certified to carry commercial passengers over water since it only has one engine. Anyway, we had to wait from 10:30 until about 2:30 because the plane was dead on the tarmack. The engine would not start; we were told it was the igniters, and the second set of the them had failed. We had to wait for the mechanic to come over from Honolulu and bring parts. Anyway, I took special note of where the life vests were located and decided it was OK since the mechanic was in the seat next to me. The pilot was in a rush to get the plane over to Honolulu as he said it needed to turn around in Honolulu to come back and do another run. Photo of the plane taken by another plane traveling by. Well, the story is predictable. The plane returned to Molokai and picked up a full load of passengers at the settlement. The engine failed shortly after lift off and the plane ended up in the ocean with a tragic result. One passenger, the governer’s Health Director (who approved Obama’s birth certificate), died in the water before being picked up. As someone who has worked a lot with electro-mechanical systems (see article about my old car), I know how hard it is to properly diagnose such problems. That’s why I had the concern about getting in the plane. Whether or not the plane should have been placed into the hangar for close examination and maintenance is something the FAA and the courts will determine. FYI, one passenger, a former marine, swam an hour against the current to get to the rocks of the island where he reportedly pulled out a waterproof phone and called his wife. Semper Fi! 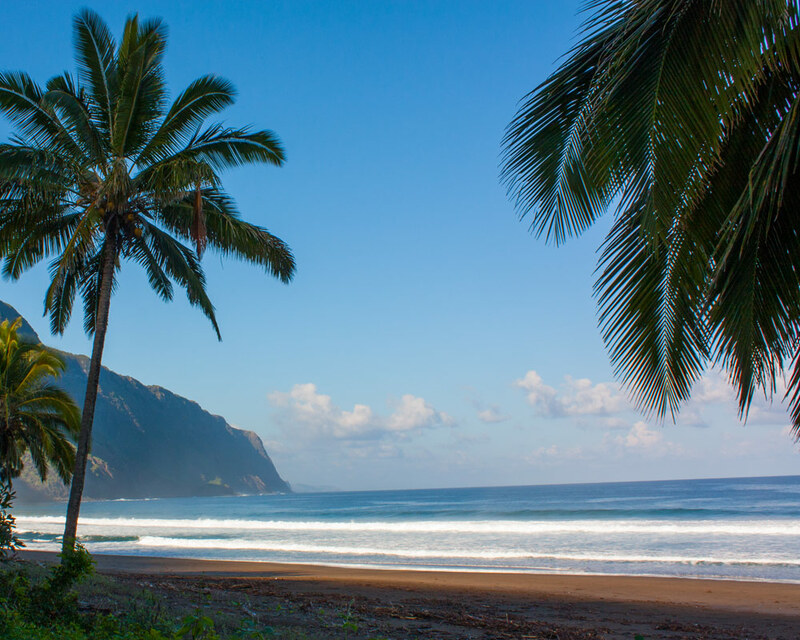 Moved to Kalaupapa, Molokai, Hawaii! A few weeks ago I left my Analytics position in Denver, Colorado, to join my partner Kate in Hawaii. She is a nurse, and she took a position taking care of the last remaining patients who were cured of Hansen’s disease (formerly known as leprosy). 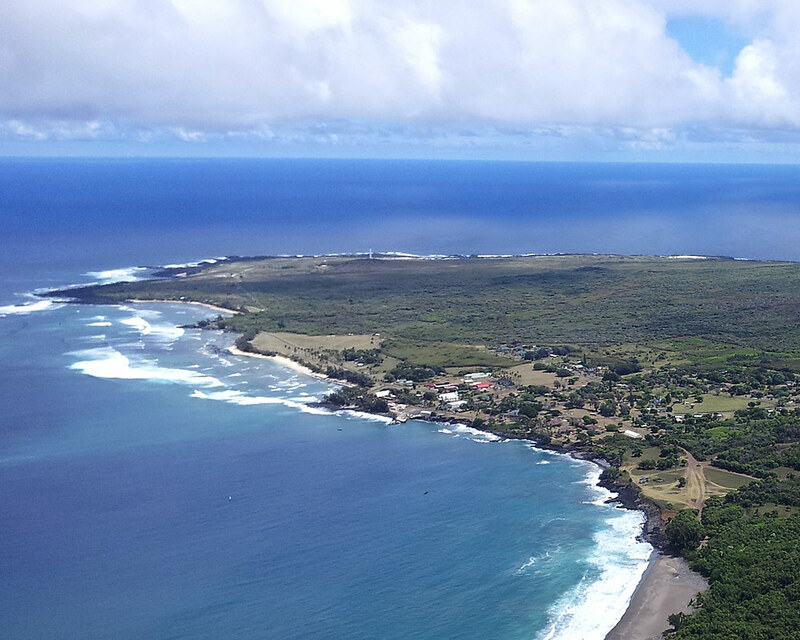 Kalaupapa has a short, but rich, history, and, for those of you who are Catholic, you may know that this small village was the home of not one, but two, saints. Father Damien and Sister Marianne came to Kalaupapa to care for those afflicted with the disease. Father Damien caught the disease and died of it, though Sister Marianne did not. Both were beatified in the last ten years. The former leprosarium of Kalaupapa is blocked by sea on three sides and 2000 foot cliffs on the fourth. Kalaupapa is visually stunning. As you can see from the photo, it is flat peninsula that extends out into the ocean. The north end of Molokai broke off and fell into the ocean leaving the highest sea cliffs found anywhere in the world. Then, 250,000 years ago, lava came up and formed the peninsula. The location was chosen for the Hansen’s patients because it was difficult to escape. At the bottom of the photo, one can see the start of the black sand beach. The next photo shows it and the cliffs more clearly. Here is a photo of the black sand beach at Kalaupapa. The cliffs (“Pali”) are about 2000 feet tall and one must climb them to walk to the main town on Molokai. Anyway, you can see why I say that the place is visually stunning. The combination of the green cliffs which loom behind you with sun, sand, and ocean in front makes for some beautiful scenery. Over the coming months, I will write more about the place. Click here to go the National Park Service site for the place.